There's No Place Like Home: Some One Needs To Light a Fire Under Me! Have you ever had so much on your "to do" list that it almost paralyzes you? I have a list of house things a mile long that I want to get done,(cleaning, organizing, painting, purging, redecorating) but I think I am too overwhelmed and I don't know where to start! I have been that way with my blog a little bit too. I need to find my camera battery charger, to charge my battery, so I can get pics off my camera and on my computer. I also need to get some pics OFF my computer, so I have room to save some new ones. The memory is all filled up! So it's a vicious cycle when you don't stay on top of things! This sweet picture is from my phone. My mom got Katie a cowgirl hat in Fort Worth. Katie's been asking for one with a pink star! They are hard to find! Nonni delivered! It's been Katie's #1 accessory everyday! 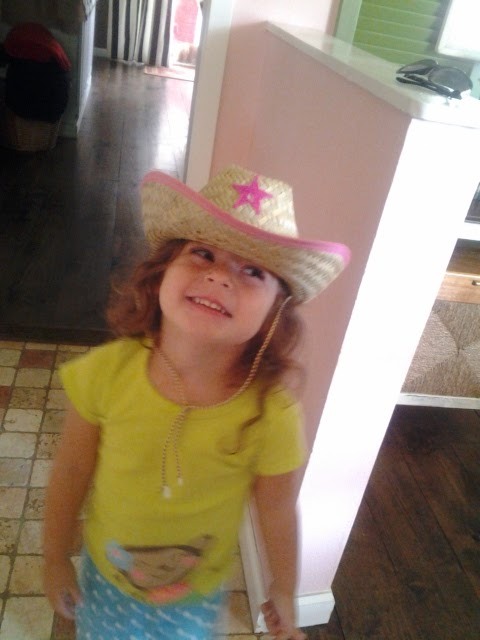 (even with her PJs) I am thinking she might need to be a cowgirl for Halloween! Katie has her first day of school on Thursday. I am HOPING I can draw a line through at least one thing on my to do list by the time I pick her up! I'm that way all the time. I promise. I may look like I'm pretty organized and on top of things but it's a struggle. I always told Russell, "I want to be stay at home mom when Sophia goes to kinder". Because I think that's the only way anything would get accomplished. :) And love the hat Katie! I am the SAME way. If I don't stay on top of projects house work and it gets away from me I almost always get overwhelmed and ignore it for a day...or two...or three ;-) ha! Currently I'm painting our kitchen cabinets and it is taking me FOREVER because it takes so many coats and isn't instant gratification ;-) So I get discouraged and stop for a few days. Ha! I need to learn patience. I'm there! BUT I was so overwhelmed that I've had to start making myself pick THREE things for my calendar/to do list each day and then delete the others or move them to like January or something on the calendar. I was trying to do TOO much and we still are not sleeping all night around here (which means I really should be in bed right now instead of on the computer!). School started last Thursday for us. Had a little flashback to last year at first but getting better already. Oh and we love pokey blocks too! :) I'll have to show him how to make people with them. Fun!